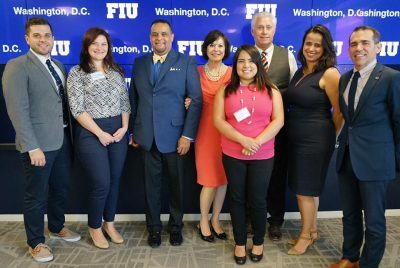 Summer 2016 included not just the launch of FIU in D.C., but also several months of programming for the university’s federal and corporate partners, student interns, and community at large. To wrap up the peak summer season, FIU in D.C. hosted a few of the organizations who have employed FIU students both temporarily and permanently for a lunch in the office. 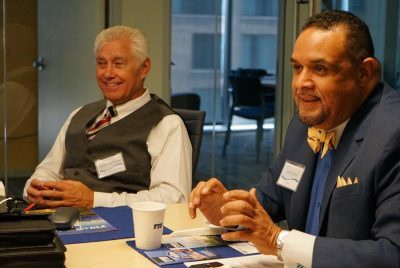 On Tuesday, Sept. 13, FIU in D.C. hosted governmental and corporate partners who have previously hired FIU students for career and internship opportunities within their organizations for an appreciation lunch at the offices and to get their feedback on D.C.-based employment needs. This past summer, FIU in D.C. welcomed 50 student interns to the nation’s capital who were placed at more than nine federal agencies, on Capitol Hill, and at public relations firms, accounting offices and the Smithsonian. Lunch attendees included Grover Chamberlain of the U.S. Dept. of Energy Office of Environmental Management; Cynthia Turner and Kelsey Lagus of Seraphim Global; Jimmy Ortiz of the United States Postal System (USPS); and Cruz Pardo of the Hispanic Association of Colleges and Universities (HACU). To kick off the event, FIU in D.C. Career & Internship Success Manager Ethan Starkey gave opening remarks on the FIU student demographic as it contributes to the university’s goal to help grow a diverse national workforce. He emphasized the importance of partnerships between the university and these organizations to both achieve this goal and expose students to professional experiences outside of South Florida. “For many, [the D.C. internship experience] is their first time leaving home. Sometimes it’s a culture shock,” said Pardo, national internship program coordinator for HACU. As FIU in D.C. plans to do, HACU hosts a professional development day for students to learn about what programs are out there for them, work on their resumes, and participate in critiquing sessions that help get them ready for other internships and future careers. USPS Manager of International Postal Relations Jimmy Ortiz also stressed the need for diversity in the workplace and encouraged fellow companies and federal agencies to look more often to Hispanic-Serving Institutions (HSIs) like FIU for new employees. 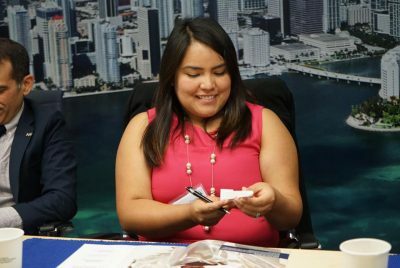 Having recently hired an FIU alumna, Tiffany Roman Biffa, to the USPS team, Ortiz’s experience with the university has exceeded his expectations. Employers praised FIU students for their work ethic, leadership skills and eagerness to learn and collaborate. “The U.S. Department of Energy fellows are so polite and professional. They’re uniquely advanced as young professionals in everything from presentation to public speaking,” Chamberlain said. 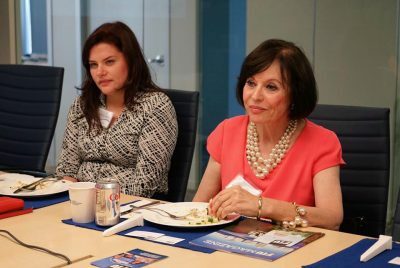 In an effort to foster these relationships, FIU in D.C. announced during the lunch that it will organize a Career Success Program fly-in this November. The program will bring selected students to the capital to connect with potential employers from the corporate and federal fields in the Washington, D.C. area. It will function as an intensive two-day “boot camp” to polish students’ leadership, research, writing and professional skills. Interested in learning more about jobs and internships in D.C. or interning in the city and want to connect with the D.C. Panther network? Contact FIU in D.C.’s Career Success Manager Ethan Starkey at ethan.starkey@fiu.edu and click here to view current job openings. 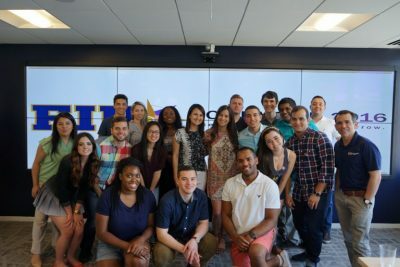 This summer marked the first semester that FIU student interns in the capital were hosted in the university’s new D.C. space for co-working, professional development and networking opportunities. The theme of the summer internship program — “Intern Today. Impact tomorrow.” — mirrored the office’s goal to expose students to the scope of opportunities available in D.C. and expand their networks with the figures and alumni who may be able to help them advance their careers in the future. Summer 2016 brought 50 interns from FIU, 35 of which were enrolled in The Washington Center, a D.C. based program that places students in courses and internships relevant to their interests and provides them with on-site housing. FIU in D.C. hosted seven independently-organized events that included foreign policy briefings and media career panels. Furthermore, the office engaged students in events around the city like a tour of the Fox News studios near Capitol Hill and a visit to the Pentagon. In a survey of all student interns, 87 percent reported being extremely satisfied with their summer experience. For more information on FIU in D.C., visit washingtondc.fiu.edu; call (202) 558-3481; or follow on Twitter, Facebook and Instagram. Tags: BeyondPossible2020 × FIU Federal Relations × FIU Governmental Relations × FIU in DC × FIUchangemaker × Internships × minorities × Student success × The Washington Center × Washington D.C.